First, some food trivia: Peas are not green vegetables, but legumes, a botanical category that includes beans, peas and lentils. They are ancient foods that have been eaten for more than 8,000 years. Man the hunter-gatherer began eating legumes as soon as he created vessels to cook them in. Legumes used to be called “wonder foods,” now they’re “superfoods.” Versatile, they are used in soups, stews, salads, side dishes, dips/spreads and more (bean burgers and lentil cakes are yummy!). They’re also a good source of protein and fiber, low on the glycemic index, and can be a fat- and cholesterol-free substitute for meat. Nutritionists recommend that we consume up to three cups of legumes a week. They are one of the healthiest foods you can eat, and are inexpensive, too. Some people shy away from beans because they are gassy. But there’s a solution for that: Just soak the beans for several hours or overnight in cold water and change the water several times, including right before you cook them. This helps to rinse away the indigestible complex sugars that create intestinal gas. *The first cultivated crop is believed to be figs, followed by wheat and barley, grapes, olives, sugar, tea, rice and sesame. There are more than 4,000 cultivars of beans in the U.S. (and many more worldwide). See our Bean Glossary to discover some of them. Beyond supermarket beans, take a look at heirloom beans. These are varieties grown from old strains, and have more flavor, better texture and a beautiful appearance. Due to lower yield, more demanding growing requirements or other factors, these strains have been passed by by large-scale commercial growers. Rancho Gordo of Napa Valley (our review). Zursun Beans of Twin Falls, Idaho. Their heirloom beans are sold in specialty food stores and online. They’re one of our favorite gifts for cooks. Create a meal-planning calendar with your online calendar system (Google Calendar is free). Map out the weekly food categories you want to include, from Meatless Monday to baking and weekend cooking projects. Add the word “legumes” every Monday, Wednesday and Friday, for example. The calendar software can block out the whole year for you. Then, as you come across interesting recipes, fill them in on particular dates, along with the URLs or other sources of recipes. 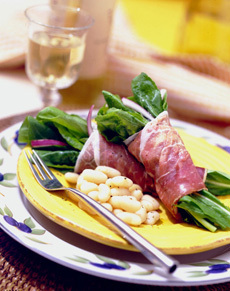 Incorporate all forms of legume recipes. For example, instead of hummus make white bean purée, which is also delicious as an appetizer on crostini. And of course, use the calendar planner for all other foods as well. 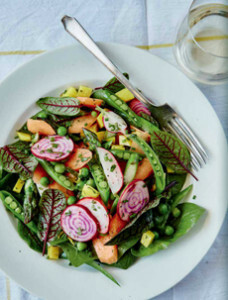 This is one of the many ways in which legumes can be combined with other ingredients for fresh, tasty results. This filling salad is both hearty and flavorful. The lentils give it a nice heartiness, and two different types of olives give it a briny punch. If you don’t like olives, substitute something you do like: cherry tomatoes, pimento, sliced gherkins, whatever. Prep time is 10 minutes, total time is 30 minutes. 2. HEAT a few tablespoons of olive oil in a pan until hot; then and add the red onions. Cook the onions for 5-7 minutes, until they’re translucent and starting to brown. At this point, add the carrots and turn the heat down to medium. 3. COOL the carrots and the onions together for 5 minutes, until they’re tender but still a bit crunchy in the center (overcooking is worse than undercooking, so take them off the heat sooner rather than later). When the carrots and onions are done, add them to the bowl with the lentils. Add the olives, squeeze in the juice of half a lemon, add a few pinches of salt and stir gently. 4. COOL the lentil mixture. When it has cooled completely, gently combine with the arugula. Add more lemon if you like, plus salt and pepper to taste. 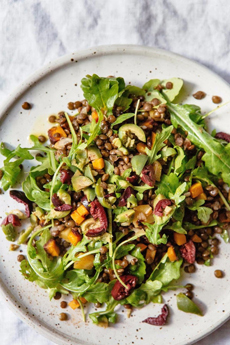 Top: Lentil and arugula salad from Good Eggs | San Francisco. 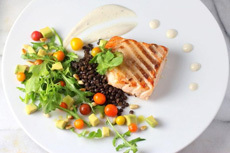 Center: Salmon with beluga lentils from Gourmet Attitude. 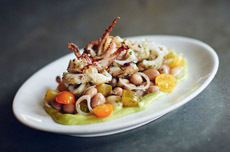 Bottom: Grilled calamari atop heirloom beans and avocado cream (think puréed guacamole lightened with cream or yogurt), with dressed vegetables, from Bestia | LA.